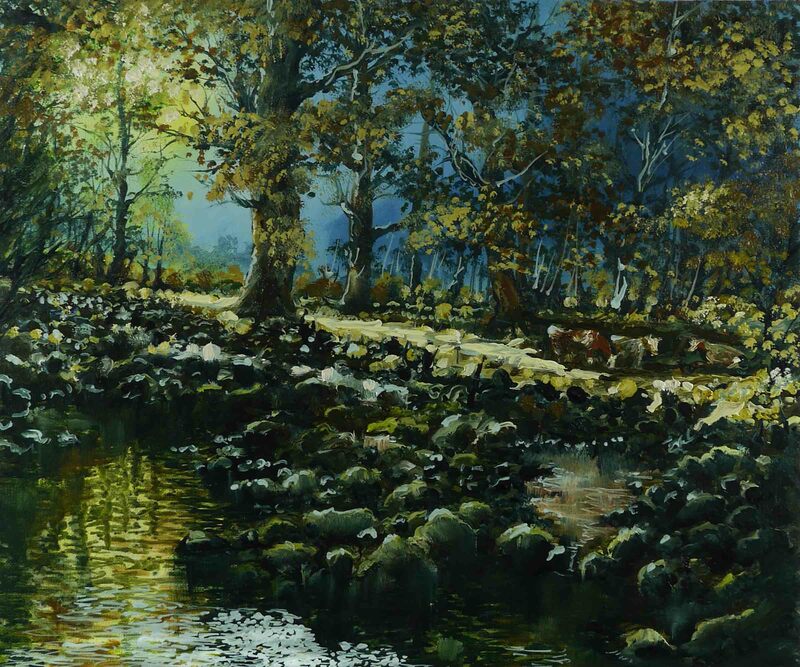 An interesting part of this painting is the reflections of light on the stream on the left. 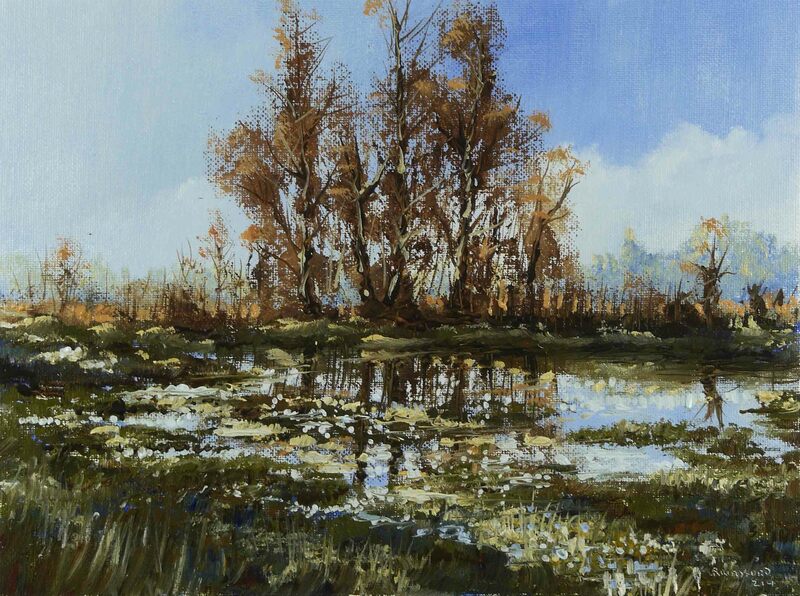 The normal procedure, in oil painting, is to paint in the darker colours then the highlights of the reflections and ripples are finally painted on top. This is what I did in the foreground. However, on the left I painted the highlight colour first. Its Windsor Lemon Yellow, a transparent rich yellow. It was applied with solvent only and by the time I was ready to ‘draw’ in the shadows and reflections, the solvent had evaporated. The Lemon Yellow highlights are better, I think, in this situation. 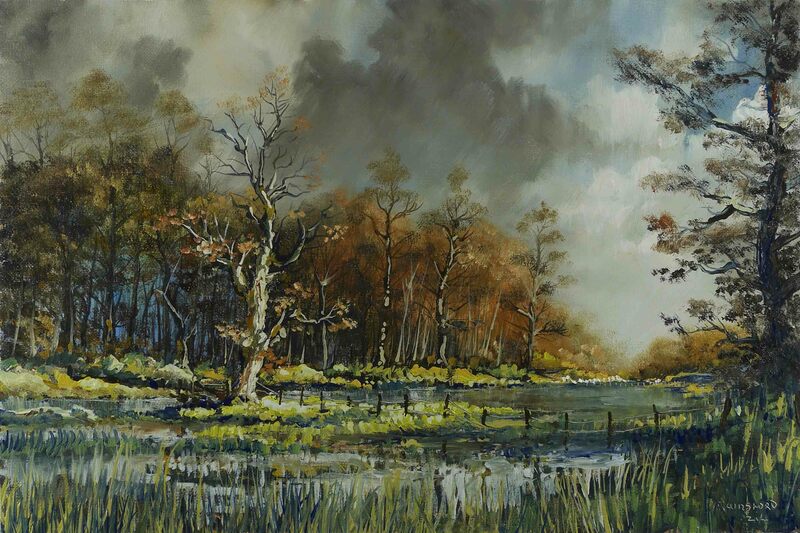 The transparency gives a subtle inner glow which I don’t a ‘whitish’ colour would achieve. 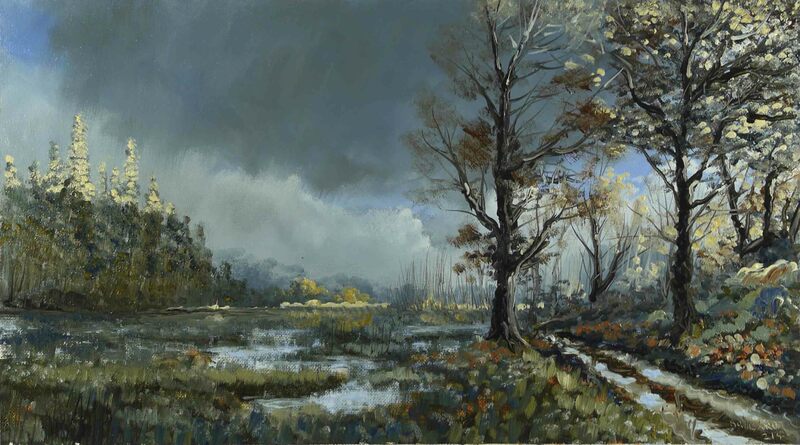 This is another painting of the our countryside after the recent exceptionally heavy rainfall. There are parts of Ireland, in the West, and many parts of the UK where the flooding is not such a pleasant happening. This is ‘marginal’ land in the process of drainage operations. In former times this would flood on an annual basis, now it’s an occasional occurrence. In a week or two it will return to pleasant pasture and the livestock will be let loose after their winter confinement. The technique is similar to the last few paintings. Layers of colour are built up using solvent only, no medium. These colour layers are dark with transparent areas which will be left in the final painting. Two areas in particular are the result of this method. The blue of the deep wood and the orange of the sunlit trees. There was a little white used in these areas, but its largely transparent colour. I used a colour in this painting I rarely use – Windsor Lemon Yellow. The other colours were the same as the last painting (here). They are Yellow Ochre, Burnt Sienna & Ultramarine Blue. The Lemon is almost a highlight colour and I used it on its own in a few areas. Its not a natural yellow and for this reason I mix it with the Ochre to calm it down a little. It also does not produce rich mixes with either the Burnt Sienna or the Ultramarine. As I usually do with a colour like this, I placed it in the sky so as not to have it out of harmony with the rest of the painting. It was applied as an under colour, not in a final mix. The under colour of Lemon mixed a little with the white, added on top and it produced the faintest of lemon tints in the clouds. Here’s the video. The painting is 18″ x 12″ and took about three hours to complete. See you soon.